Just imagine if Treasury Nominee Jack Lew were a Republican named Mitt Romney. Maybe He Meant Higher “Steak” Taxes? Why do we listen to this plutocrat when we apparently don’t want to listen to this one? Emily Litella comes to mind. What’s Really Going On in this Photo? The media never got Romney, did they? WaPo is presenting “I’ll change your bedpan” as abject and pathetic. Are they only pretending not to understand or does it truly escape them? Romney is a good man. 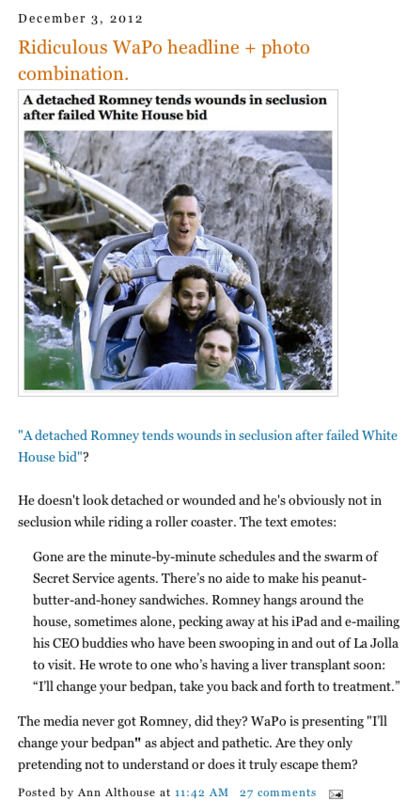 Too bad he’s riding this roller coaster rather than the one President Obama’s on. 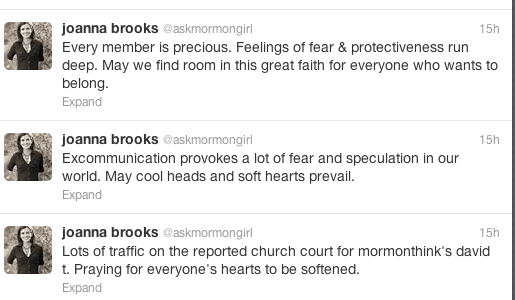 So Mormon author (and sometimes critic of Mormonism) Joanna Brooks is all a-Twitter about the need for a big-tent Mormonism. Just don’t give Mitt Romney the address to the tent. Fair Criticism or Hit Piece? In Wednesday’s New York Times, Jared Diamond, author of Guns, Germs, and Steel, takes Governor Romney to task for misrepresenting the thesis of his book in the Governor’s speech in Israel. He goes so far as to “doubt whether Mr. Romney read” his book. In my view, Diamond’s NYT op-ed is an uncharitable hit piece masquerading as indignant criticism. That’s not to say that Romney was completely accurate in his discussion of Diamond’s book. It is to say that Romney got the thesis–as stated by Diamond in the NYT–essentially right; that his mention of iron ore, though a bit off base, captured the essence of what Diamond said about iron in his book; and that judging by Romney’s discussion of Diamond’s book in his own book, No Apology, Romney has read Guns, Germs, and Steel. Before we begin, let’s remember the context of Romney’s speech. He was speaking at a fund-raiser in Israel. He spoke about a variety of issues for around 20 minutes. I’ve not been able to find a copy of the speech–if one exists–but judging by something he said, I’d guess the speech was an off-the-cuff recitation of his stump speech, tailored to his audience (more below). What it was not was a book review of Diamond’s book. What it was not was a point-by-point discussion of Diamond’s thesis. And that’s important. Note, the words “and so forth.” That’s the little throwaway that tells me Romney was speaking off the cuff and without notes. Note also that he summarizes Diamond’s book in about 30 words–hardly a full discussion. That’s it. As far as I can tell, that’s all that Romney said that relates to Diamond’s book other than the next paragraph where Romney mentions David Landes’s Wealth and Poverty of Nations, which I’m not going to discuss here because my interest is in Diamond’s criticism. In his best-selling book Guns, Germs, and Steel, Jared Diamond notes that long ago, the availability of minerals like iron ore meant that some nations could fashion weapons and conquer their neighbors while others without those minerals could not. The complex geography of germs and disease could cripple the economy of one nation while opening new possibilities for another. A nation’s rivers, mountains, and deserts dramtically shaped the transportation network essential for trade and economic development. For scholars like Diamond and many others, the relative differences between nations and people are largely the result of these kinds of inherent natural features. To a degree, there is truth in that perspective, but it simply doesn’t fully account for the great differences between nations and civilizations. Diamond is right that in both in his speech and in his book, Romney does imply that iron ore was unevenly distributed around the world, when in fact what was not widespread was the ability to turn iron ore into steel. A different disparity, but a disparity nonetheless, and apparently an important one, given that Diamond points out in his book that the Europeans “truncated the New World’s independent trajectory.” Why? Because “New World societies had . . . not yet started making iron [artifacts]” when the Europeans arrived. Isn’t that essentially the point Romney was making in No Apology, that some had iron weapons when others did not? The only difference is Diamond attributed the relative circumstances to metallurgy; Romney mistakenly attributed them to the uneven distribution of iron ore. Furthermore, Romney–especially in his book–briefly covers the same ground Diamond does in his NYT summary of his book’s focus. As someone who has read neither Romney’s speech nor Diamond’s book in their entirety, I ask anybody to explain to me how Romney’s brief discussion of Diamond’s book is so far off base as to warrant an op-ed response in the New York Times. Then tell me if you think Romney has read Diamond’s book. UPDATE: Given that Diamond forgot that he did discuss iron ore in his book, isn’t it only fair to give Romney some slack for forgetting that the it was metallurgy that was not widely distributed across the earth rather than iron ore? Speaking to supporters in Birmingham, Alabama, Gingrich vowed to remain in the campaign, saying he would fight all the way to the party’s national convention in Tampa, Florida. Still, with victories in only South Carolina (PCSTSC) and Georgia, the former Georgia congressman and U.S. House speaker now faces a struggle for his political survival. For all the hype about his woodenness, Romney, I submit, actually has the most sophisticated — and underappreciated — sense of humor of any presidential candidate. It is dry, self-deprecating and a bit dark, a far cry from the safely hokey laugh lines of most politicians on the stump. And it bespeaks a confidence and flair not often attributed to the much-maligned candidate. That’s what I’ve always thought. I have some experience with his sense of humor, as I mention in another post. I was interviewing him once in the lead-up to the SLC Olympics as part of a panel of journalists and TV news people, a panel that included ESPN and some guys from KFI out of LA. We all sat around a half-moon shaped table, with Romney sitting in the middle of the straight side of that table. One by one, each reporter asked his or her series of questions, most of which revolved around security, given the recent events on 9/11. Finally it was my turn to ask questions. I introduced myself as representing the Marriott School Alumni Magazine. He knew I was there to ask about his CFO Fraser Bullock for a profile piece. But for my first question I asked Mitt what he was going to do so that the Los Angelenos coming to the Games wouldn’t confuse Utah’s powder with their favorite nose candy. I asked the question as pokerfaced as I could. Now I admit that my joke was of the you-had-to-be-there variety. But in that setting and at that moment, my timing was excellent and the line worked. It caught him totally off guard, and he laughed hard. So add that to the evidence that Mitt Romney has a sense of humor. He laughed at my joke. If you do that, ipso facto, you have a sense of humor, even a sophisticated one. I support Romney. And I’ve tired of the ridiculous questions about his religion. Most I’ve read have betrayed more about the questioner than they ever will about Romney or his Mormonism. That said, there are legitimate questions. Sarah Posner, Senior Editor at Religion Dispatches, has an article at Salon.com where she asks some of them. What about Blacks and the Mormon priesthood? What about Mormonism and feminism, particularly in the 70s and 80s? And so on. Sarah’s tone is generally fair, as are the questions she asks. I’m interested in how Romney would answer them. Judging by what I’ve already heard about how he felt about the priesthood ban and by what I’ve read in stories like Peggy Stack’s 2008 article for the Salt Lake Tribune, I think he’d do just fine. That said, the questions do present a problem that Posner fails to acknowledge. Responding to even these appropriate questions involves going deeper into Mormon belief than even the most interested journalist may be willing to go. And that might result in a poor, even unfair story being written by a reporter who tuned out as soon as she heard the bit she wanted to hear. To me, that’s one reason Romney may be reluctant to talk about his religion. Like me, he surely holds his beliefs sacred. Like me, he probably would rather that people understood how the Book of Mormon impacts how he deals with some of these difficult issues. Allow me to give an example of what I’m talking about. I grew up in the 60s and served my mission in the Brazil North Mission from June 1971 to June 1973, before the 1978 so-called Revelation on the Priesthood. I supported the practice of not extending the priesthood to Blacks. Now, stop there, and I’m a racist. But that’s not even close to the truth. The truth is, I wasn’t a member of the Church because of the ban; I was a member in spite of it. And even that statement just scratches the surface of the story of me and the priesthood ban. So imagine you’re a reporter, and you want me to go beneath that surface. Do you have the time and interest to hear me explain what I mean by what I just said? Are you ready for me to go into what the Book of Mormon means in my belief system and how it affects so much of what I do? Are you willing to listen to, then write fairly about, what the idea of living prophets means to me and why that belief would affect how I dealt with the priesthood ban? How receptive will you be to the evidence I would muster to demonstrate to you that I have always–always–treated people of color with love, that I have never condescended to them, that I’ve tried to treat everybody everywhere as equals, and so on? If I were Romney and I could be sure that I’d get a fair hearing and that the writer would report my responses fairly, honestly, and without any mind reading, I’d jump at the chance to talk about the priesthood ban and any other Mormon questions they might have. But like Romney, I have doubts that would happen, and so I hold back. My sacred and deeply held beliefs don’t fit on bumper stickers. They aren’t made–aren’t appropriate–for 15 second sound bites. They just aren’t. Unfortunately, the political public seems to thrive on a diet of gossamer statements truncated to fit on the rear fender. And there’s the conundrum. Well, in light of the immediately preceding post, this is pretty amazing: New York Times columnist has written about Romney’s dog on the car roof story over 50 times.